Popsicles ? The constant call for sugar-filled freezies, popsicles, and other cool treats is returning now that summer weather is back. Kids and adults alike need a treat to cool down every so often! I’m a fan of blending fruit smoothies and freezing them in pouches, but they tend to be too heavy and filling when you just want a light, refreshing snack. And so is born… Iced tea fruit pops! David’s Tea recently had a sale on some herbal fruity teas, iced tea presses, and popsicle molds. You can find similar anywhere from Amazon to your local grocery store, however, and make the tea in a regular cup or jug! You can really use any that sound good to your family! Add a touch of stevia, honey, or agave, and you’re set! I personally love the options at David’s Tea, but you can easily find some at your shop of choice or use what you have at home! These are kid tested and approved ? Add tea leaves and near boiling water to your press or jug. Fill to water line or as much as you would like (typically use double the tea leaves per cup of water as you normally would as ice will dilute it). Allow to steep for the maximum time listed on the tin (in this case, 7 minutes). Add honey and stir well. Use press insert filled with ice or remove tea bag from the jug. Allow tea to cool. 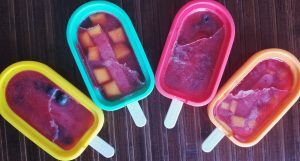 Add sticks and blueberries to popsicle molds. Pour in tea until each is filled to the line. Add cover/lid. Freeze for 4+ hours. Enjoy! Copyright © 2019 The Avocardio Mom.